There’s some good news out of CES 2014 for anyone who relies on Dish Network or is considering switching to the satellite TV provider. 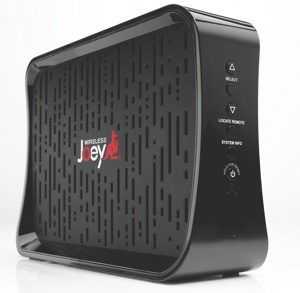 On Monday, the service announced the Wireless Joey, a new WiFi TV box for rooms not already wired for cable. The new Wireless Joey works on its own independent 802.11ac WiFi connection shared with the required Wireless Joey Access Point. No home Internet connection or router is required to enjoy the box, though your Access Point will need to be connected to a main Hopper DVR box (hardwired during installation). Another limitation: You can only have up to two Wireless Joey boxes in your home, a limitation Dish says prevents degradation of video quality. Inclusion of a wireless box is a big deal for a satellite TV, since Dish is especially popular with rural families who still lack access to wired cable TV. If your home isn’t wired for cable, installing satellite in each room requires running cables through your walls to each room … unless you have a wireless option. If you’re especially adverse to home improvement projects, the Wireless Joey may be for you. For the truly TV-hungry viewer, Dish also announced the new Superjoey box at CES. It’s capable of recording up to eight shows at once. Sure, there are a few minor limitations – four of the tuners are set to ABC, CBS, FOX and NBC – but otherwise, it’s hard to complain. Eight is a lot. Dish Network wireless packages start at $29.99 with a two-year commitment, everyday prices start at $49.99. For more about Dish and its service, visit dish.com.